It was B-Day for Chrysler today. Unfortunately, no one was celebrating as this wasn't your usual B-Day. It was a day of unknowns, as the largest pre-packaged attempt at bankruptcy is about to progress for the next 30-60 days when a new Chrysler-Fiat entity will emerge from the flames. 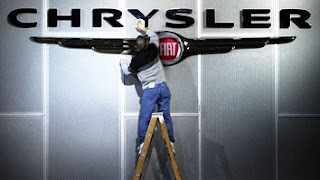 Bloomberg News is reporting today that the "'New Chrysler' [will become] a wholly owned subsidiary of Fiat, would assume some of the old Chrysler’s liabilities, and pay $2 billion into the company’s bankrupt estate, according to court documents." For the automotive advertising world, Chrysler's Agency of Record - BBDO - is currently the second highest unsecured creditor which is owed $58.1 Billion. What happens to BBDO during this process isn't going to be pretty since so many are inline before them to get paid. It's fairly certain Chrysler won't be doing any advertising during the bankruptcy 30-60 day process. Unfortunately for Chrysler the day also included some Twittering from the @Chrysler account that referred Twitter users to a new website http://www.ChryslerRestructuring.com, that was obviously a rushed job. The Epiq Systems restructuring website holds a few press statements. Apparently, Epiq Systems provides "innovative technology solutions for litigation, bankruptcy, and financial transactions." Looking at Epiq's own website, they look like an alternative energy provider complete with windmills and blue skies. I'm not sure what's so "innovative" about Epiq Systems? The site they created for Chrysler is very HTML 2.0, circa 1996. Let's hope Chrysler at least hires an effective legal council. In closing, it is a sad day for Detroit and I do wish the best for the employees, families, suppliers, dealers, and businesses indirectly impacted by Chrysler's bankruptcy filing today. It will definitely be an interesting thing to watch as Chrysler is the first to attempt this new form of rapid "pre-packaged" bankruptcy. Let's just hope a healthy new company can emerge that can build innovative, desirable products.